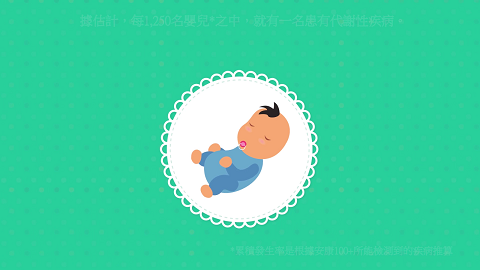 What is Newborn Metabolic Screening? It is a screening for every newborn for many harmful or potentially fatal metabolic disorders (also known as inborn errors of metabolism, or IEMs for short) that are not apparent at birth. An inborn error of metabolism (IEM) is a rare genetic disorder where the affected baby lacks certain enzymes that maintain normal bodily metabolic function, causing the build-up of toxic substances or deficiency of critical substances required for development. Screening your newborn will facilitate early treatment and prevent long term detrimental effects to your baby’s health. Screen your baby from 48 hours (2 days) after birth, up until 6 months of age. Ideally, your baby should be screened between 2 to 7 days after birth. Your baby’s urine can be easily collected by inserting filter paper into the diaper without causing any harm or discomfort to your baby. More than 100 life-threatening metabolic disorders can be detected from a single urine test. The results will be available within 14 working days upon receipt of urine sample at StemLife laboratory to enable early treatment, if necessary. Advanced and FDA-approved GC-MS technology combined with proprietary bioinformatics to reliably detect more than 100 metabolic disorders.